A blazer is the ultimate piece to help dress up a pair of jeans. Earlier this week, I shared a dressier work look. However more often than not, I do go for casual. Sometimes I am sitting on chairs for 5 and 6 year olds, sometimes I am crouching down to work with a student one-on-one in class. Skirts and dresses are not always the best choice for attire on those days. A pair of printed pants, dress pants, or colored jeans are my go-tos. Dressing them up with a blazer makes me look and feel professional throughout the day! 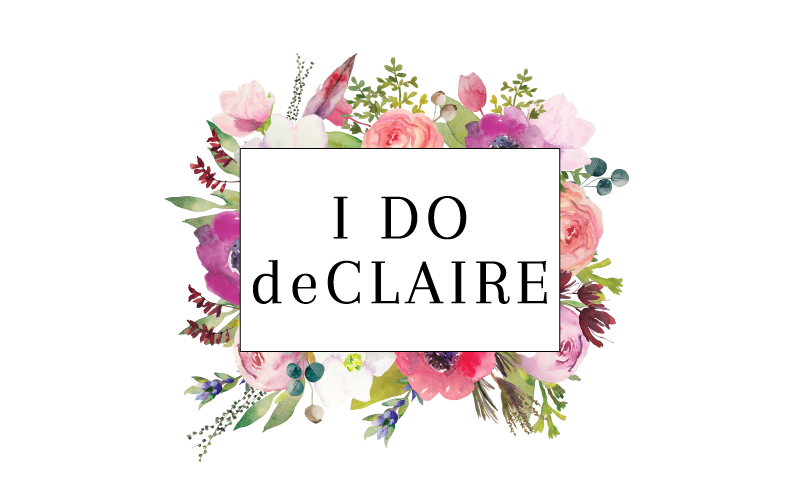 I have a fun giveaway for you today for a $100 iTunes Giftcard! Check out the detailsand enter to win below! Good luck! 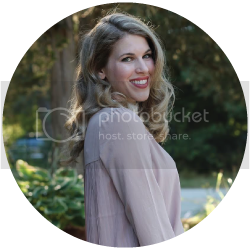 This is such a cute casual work outfit! Love the color combo! very cute!! love the red pants. i need to get mine back out of the closet! Very classic and timeless look! 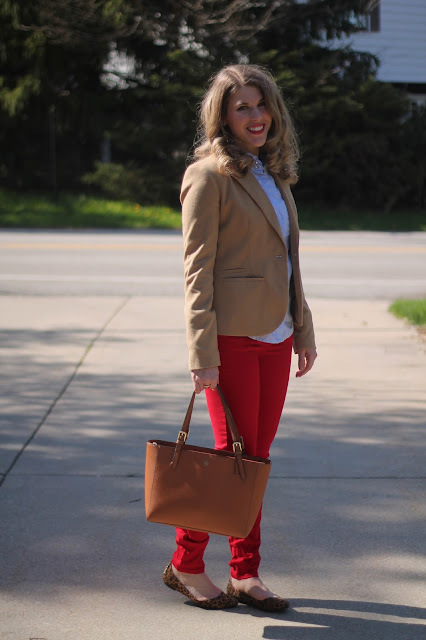 I really like the red pants in this outfit, they give the pop of color that makes everything extra fun! I agree, blazers can easily dress up a casual jeans look! Love how it elevated your outfit too. Red and tan is one of the best combos! This is such a chic outfit. I'm a huge fan of a blazer too---I always felt more professional in one. I especially love how bloggers are wearing them with jeans ---to me that's the perfect casual combination!! I'm in love with your blouse----I think embellishments are the perfect way to bling up a work outfit with little fuss! This outfit is so chic, yet fun with the red pants and the jeweled detail on the collar of the blouse! If I won, I would give it to my teenage son. 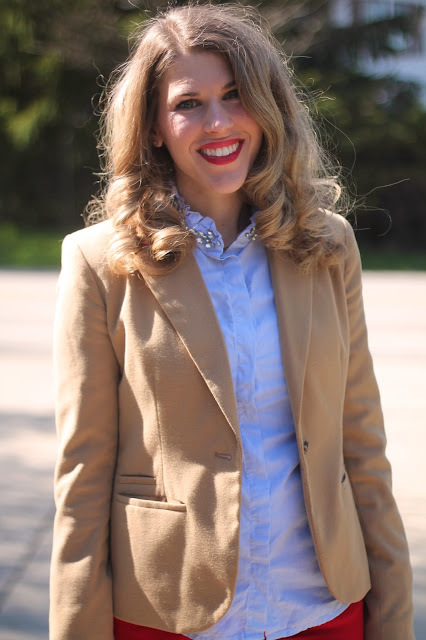 I use blazers to dress up my more casual looks at the office so I don't feel like a total slob when I walk into a customer meeting on a Friday. You are totally right, blazers can dress up any outfit! Beautiful look, and obsessed with your top!! I love the way a blazer brings structure to a look! I love this with the red and blue! Agreed that the easiest way to dress an outfit up for work is to add a blazer! I've been trying to wear my blazers more this spring and I'm loving it. 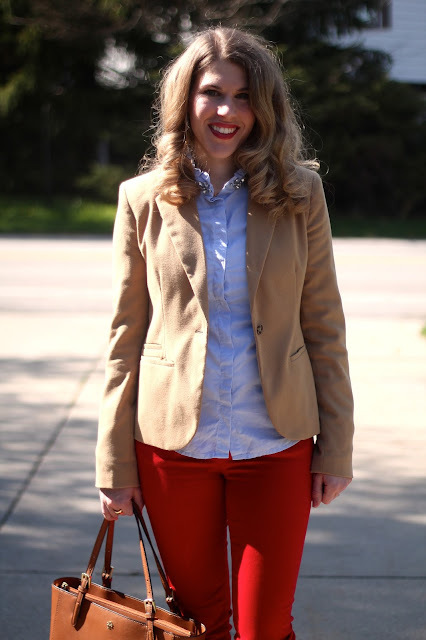 I love the red jeans - and what a great way to wear them for work with a blazer. I'm all about adding a blazer to dress up a more casual look too. I love all the fun elements you have working here, like the red jeans, jewel-embellished collar, and leopard shoes. And I would buy a lot of music with $100 to iTunes. What else do you buy on iTunes... clearly I'm behind the times. A blazer really does dress things up a lot! I think the camel color works really well with the red - such a good combo! And you're hair is looking so pretty! Love how you paired the camel with the red. That such a beautiful combination! These are colors I probably wouldn't think to pair together, but I LOVE them together! I am sure it is hard to work with kids, this outfit I am sure works well!! And, I think you've shared that button down shirt before, but it is a fave of mine! The jeweled collar on your blouse is such a nice touch, and I do agree, nothing is better than a blazer to add polish to a denim look. Love this blazer and the pop of red with the trousers! Perfect casual look! You always pair camel and red in the most perfect way. I just love this polished work look where that pretty blouse shines! Happy Mother's Day Weekend Laura!! I agree - a blazer really dresses up any outfit. I love your red jeans too. I have a pair of red jeans, I should get them out again! Great work outfit! I also often dress fairly casual clothes up with a blazer! I love this color combination! Your hair looks so cute too!